It takes time to develop your personal approach to real food! Here’s my manifesto for healthy eating, plus how I’m progressing on my real food journey. When I was little I had a great appreciation for food, but never worried much about what I ate. Multiple reasons for this: Mom was a good cook and created colorful meals, “worrying” about food was for adults, and the doctor never, ever told me to lose weight (yes, the italics imply the opposite). But as I’ve increasingly selected and bought my own food, I realized there was more to consider about food than weight and diets, and that I could benefit from a little more research on how to create my own good and colorful meals. 2. There are lots of good, real-food options out there. In order to minimize the effects of the first fact and to maximize the latter, I’m learning how to better navigate the grocery store; how to survey my options; to get creative with what I eat, where I find it, and how I prepare it; to understand ingredient labels better; and to make small steps toward better health in general. I’ve found the observations of Dr. Weston A. Price to be helpful for setting an overall approach to healthy eating. Dr. Price was a dentist who traveled the world in the 1920s and 30s to research remote people groups and their diets, in part to discover what made them healthy as opposed to North Americans, whose overall health seemed to be deteriorating into multiple diseases and (his specialty) tooth decay. In contrast to the typical American diet, which consisted increasingly of foods processed by modern methods, Dr. Price found that the diets of the remote peoples were high in foods that were nutrient-dense, readily-available, and prepared according to traditional methods. That means that they didn’t have to rely on fortified flour, pomegranate juice, and Cooking Light to enjoy excellent health. Not to say that exotic, high-priced fruits, low-fat recipes, and the feeble attempts of the mass food industry have their place, but there’s a simpler and more beneficial way to eat. To be perfectly honest, I didn’t think that my approach to food would change so radically. I guess I just didn’t realise how much refined and genetically modified food I was actually eating, or how easy it is to actually make wholesome food from scratch. And I’m not just talking about “recipes” like muffins and soup (I’ve always loved to make those! )–the basics can be made from scratch too, like yogurt and cream cheese and barbeque sauce. To me, the concept of eating real, whole foods raw or prepared with nourishing ingredients is super simple and much more freeing than the strictures of any prescribed diet. On the flip, it also takes a lot of work. I’m spending time preparing more foods from scratch, doing price comparison, and researching labels and ingredients so I can be frugal, informed and a better cook. In the style of Captain Barbossa, I try to follow a few guidelines when approaching food but stay away from overly-specific rules, which can easily be broken. I’ve also begun to develop a list of the foods that I think are some of the most important, and should be frequent flyers in my diet, as well as a list for the foods that I’ll most often avoid. 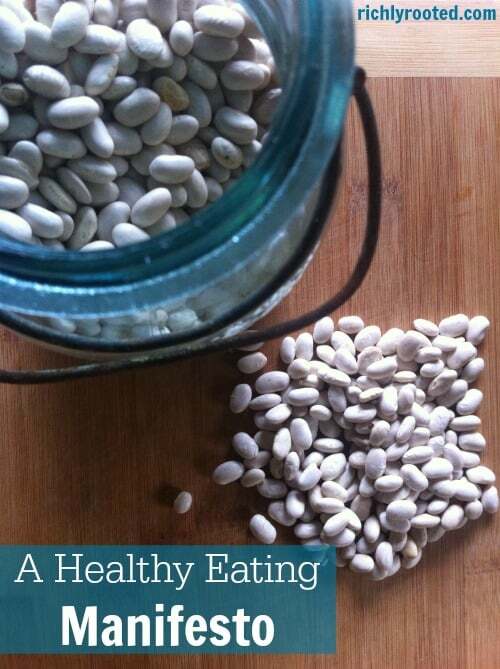 Want to say goodbye to processed food and start feeding your family the good stuff? 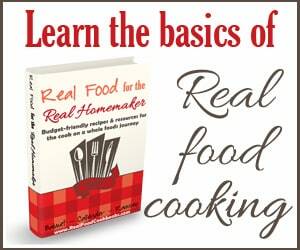 My cookbook, Real Food for the Real Homemaker, is all about making real food from scratch! It includes 75+ recipes that are simple to make and use wholesome, familiar ingredients, and has 8 chapters on topics like food substitutions, kitchen tools, and freezer cooking. Pick up a copy HERE. I have recently been introduced to the Real Food diet and Weston Price information. My husband and I have been on the path to adjusting our diet for the past 1-2 months. In making these changes, have you become overwhelmed with the amount of change needed to eat in a traditional manner? How did you make the changes to your diet and specifically to meal planning? Meredith, I think you will love the Real Food diet! It makes you feel great, and it just makes a lot of common sense! It can be overwhelming to feel like you have to make a hundred changes at once…just consider the ones you’ve already made. Set a few simple, straightforward goals, like cutting back on soda or finding farm-fresh eggs; when you’ve “got” those, pick something else. You’ll find a lot of controversy even amongst Real Food circles (like what kind of rice to eat, how to prepare grains, etc.). Don’t let that trip you up. If it’s real, actual food, eat it! As your body balances out with a Real Food diet, you’ll learn how to fine-tune your diet to what makes you feel optimal. For meal planning, it helped/helps me to keep things nourishing by keeping things simple. For me, that means not a lot of side dishes. So we might have just beans and rice for supper, with sliced avocado on top. Or just put a whole chicken in the crock pot and make rice to go with it. We eat whole fruits and veggies between meals, too, since that takes no prep work. We eat good, wholesome food, but we keep it super simple (unless we feel like/have time for fancy stuff!). I usually post our supper menus on a weekly basis, I just haven’t for the past couple of weeks!